This salad is perfect for your lunchbox, a quick lunch or dinner served with some salmon, shredded chicken or simply on its own. Leftover roast vegetables are ideal for this salad, toss through the sauce with the fresh green vegetables and it’s all done. The tahini dressing also works great instead of mayonnaise in coleslaw. Rinse the quinoa and bulgur in a fine sieve whilst you bring the 500ml water to the boil. Once the water begins to boil, add the rinsed grains, place the lid on the saucepan, reduce to a simmer and cook until all the water is absorbed about 20 minutes. Take off the heat, remove the lid and allow to cool. Preheat an oven to 220°C/200°C fan/475°F. Melt 2 teaspoons of coconut oil in a roasting tray. Peel the carrots and sweet potato and cut into cubes with the beetroot. Mix the veg thoroughly with the coconut oil and roast in the oven for 20 minutes. Once cooked, set aside to cool. Place the seeds and cranberries into a bowl and cover with boiling water. Strain just before adding to the salad. Finely slice the spring onions. Slice the celery stalks into rounds. Slice the cucumber in half and remove the soft centre before cutting into rounds. For the dressing: stir all the ingredients together until they are smooth. 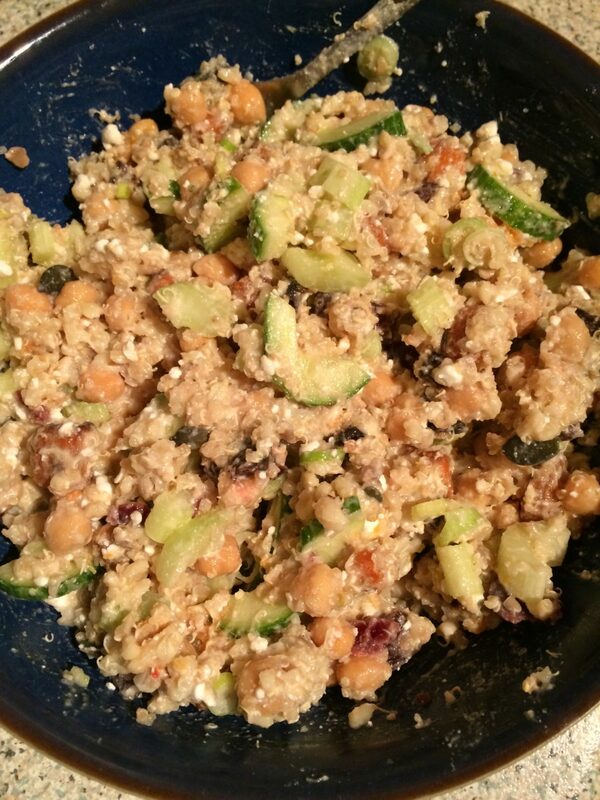 To assemble: place the cooled quinoa and bulgur into a large mixing bowl with the remaining ingredients and dressing. Stir to combine. Newer Previous post: Get Your Pancakes! !